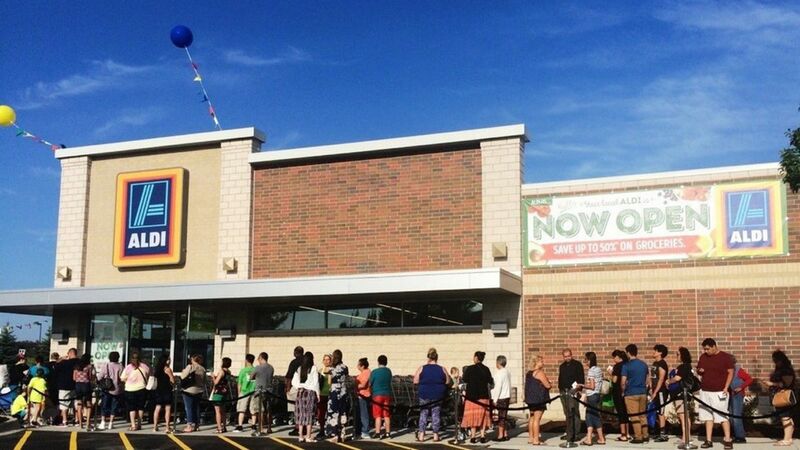 The German discount grocer Lidl made its United States debut this June, opening 20 stores in the Carolinas and Virginia just weeks after its compatriot Aldi announced its own expansion plans in the U.S. earlier this year. The timing could not be worse for established chains like Walmart and Kroger, which have simultaneously been digesting the news of Amazon's Whole Foods takeover. Unfortunately for Walmart, it's a move that indicates the e-commerce giant is turning its attention, and tolerance of razor-thin margins, to the lucrative grocery segment. Battle lines: Lidl entered the market aggressively, with prices in its Winston Salem, NC, store that were 9.1% lower than the local Walmart, according to a study conducted in June by Jefferies analyst Christopher Mandeville. Given those results and Lidl's "enjoyable" shopping experience, he says Lidl could be "highly disruptive" to incumbents like Walmart. But the tide may be shifting, as it appears Walmart has cut the price differential to just 2%, according to a survey by Oppenheimer that looked at prices roughly a month after Jefferies visited the same locations. Milk war: Oppenheimer analysts Rupesh Parikh and Erica Eiler write, "pricing appears dynamic and cut-throat" at the Walmart and Lidl locations they visited in Winston Salem. "During our visit in the afternoon at Walmart, [a gallon of] milk was priced at $2.08. When we went back in the evening, milk dropped to $1.95. Lidl had its own deals, with a carton of eggs on offer for just 52 cents. It does very much feel like a grocery price war," they write. Walmart's facts on the ground: Mandeville writes that Walmart's best weapon in the grocery wars is its large network of stores — the company says it has store locations within 10 miles of 90% of the U.S. population. These stores can serve as warehouses for its growing e-commerce business, and as it tries to grow its online business. Who is really at risk: Parikh and Eiler think that Kroger (rather than Walmart) is more threatened by German upstarts. Aldi has been in the U.S. longer than Lidl, and has big plans to become the third-largest grocer in America. But Parikh and Eiler were unimpressed, calling Lidl "a bigger and nicer Aldi," which had "wider aisles, enhanced lighting, and a bit more upscale feel," they write. Why it matters: Customers are usually the beneficiaries when deep-pocketed foreign firms enter the U.S. market. No doubt the grocery shoppers of Winston Salem and other markets are enjoying the ongoing price war.